Postman won a Mavericks viewing party package from one of his favorite sports radio shows The Williams and Hyatt Show on Monday by answering a Mavericks trivia question. 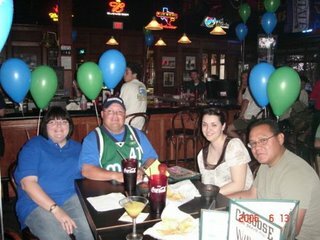 The package included front row seating in front of the HD Big Screen TV at 50th Street Sports Bar and Grill, $10 gift certificates and 40 tokens for Charles and four of his closest buddies. 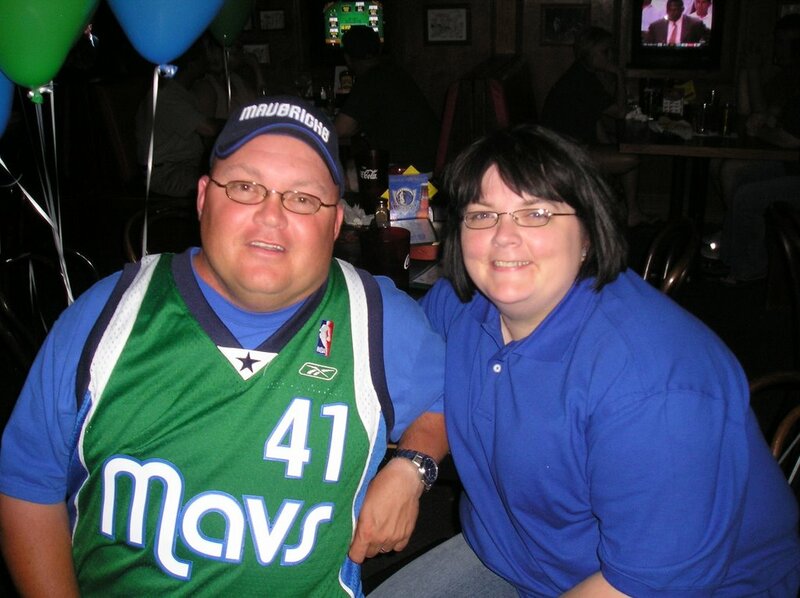 The quest for a Mavericks shirt…because Postman did not own a Mavs shirt, we went on a quest to find one for him in Raiderland. We looked at every stinkin’ store in the mall..nothing…we looked at K-Mart and Walmart..nothing. He was able to find this Dirk shirt at Champs in the mall after an exhaustive search. I opted for the Maverick blue polo shirt. A good time was had by all in attendance. I had three drinks…1 Sunsetini (vodka, orange juice, and peach) and 2 Appletinis. I was feeling mighty good by game time. The food was great and the atmosphere ok. I was hoping it would more rowdy than it was, but overall fun. We left sometime during the 3rd period because the smoke was getting bad and we had to be at work the next day. Unfortunately the Mavericks lost to the Heat 98-96. Looks like no sweep for the Mavs–oh well, they still lead the series 2-1. Yea for you and The Postman ! Actually, Postman had no adult beverage of his choice that night–SHOCKING–isn’t it? Well, one of us had to be the ADULT and he lost the coin toss.